I'm a little baffled about the yarn for the Effortless Cardigan. The suggested yarn is Tosh DK. DK knits up to around 5.5 stitches/inch on US 6 needles. 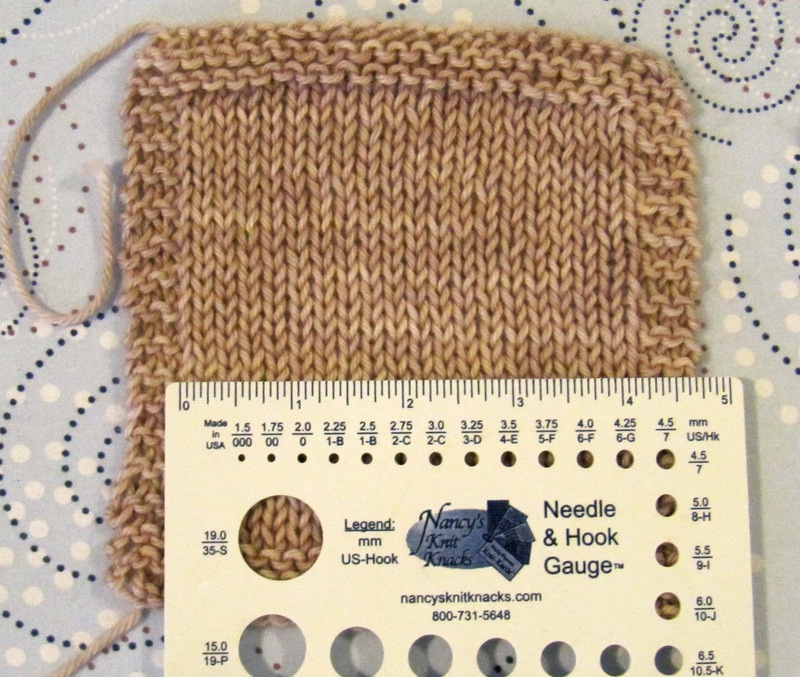 However, the pattern gauge is 19 sts = 4 inches on size 9 needles. 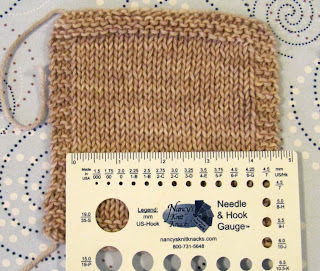 Normally you would get that gauge with a worsted yarn on size 7 or 8 needles. I was doubtful, but decided to make the swatch with the pattern suggestions and see what I'd get. I didn't even measure my swatch, nor did I finish it. I'd only done a little and it was obvious that it was going to be much bigger than 4 inches, and the fabric was very loose and unappealing. On the pattern page the suggestion is made to use a worsted weight yarn if you are substituing. My next guage swatch was done on size 8s, which was still too loose and big. Then I tried size 7 and it appeared to be right, that is, until I washed it. - a gentle soaking in Euclan. As you can see, my swatch grew and it's still too large. The resulting fabric is improving, however. So, three swatches have been made. Now, onto swatch number four on size 6 needles. I wonder if it will be the last one or will I have to go on to try size 5s? Updated later in the day: It looks like I'll be using size 6 needles. The swatch tells me that it's the right choice. I hope so. Swatches are notorious liars! One other thing. I know that monitors show colors differently, but I'm guessing that almost every one will show my swatch as beige, with perhaps a hint of a pink tone. The shade is "gossamer". Apparently the picture of the sweater on the pattern is gossamer. It looks blue/gray to me. I wrote to the people at Madeline Tosh and they said that gossamer is beige. Again, something seems a bit off, but the gossamer I received is nice, so I won't complain. It just leaves me a bit curious. TGIS = Thank Goodness I Swatched! That's pretty amazing and may explain why I am not so hot on knitting sweaters - or anything else that needs to "fit".